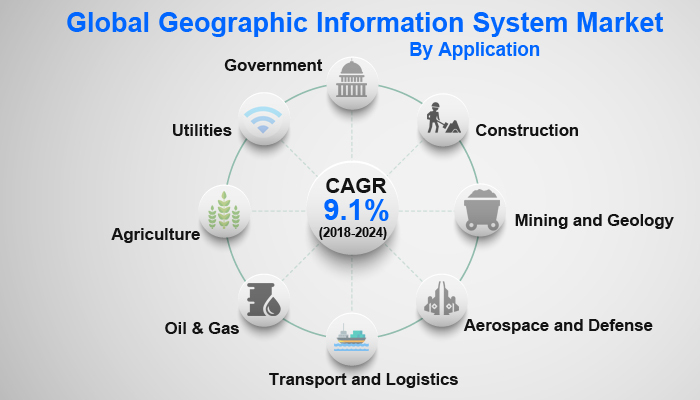 A recent report published by Infinium Global Research on geographic information system market provides in depth analysis of segments and sub-segments in global as well as regional markets of geographic information system market. The study also highlights the impact of drivers, restraints and macro indicators on the global and regional markets of geographic information system over the short term as well as long term. The report is a comprehensive presentation of trends, forecast and dollar values of global geographic information system market. According to report the global geographic information system market is projected to grow at a CAGR of 9.1% over the forecast period of 2018 - 2024. The geographic information system market is driven by infrastructural developments such as water and land management, services and urban planning. Several decisions are taken using GIS, right from tracking a store location to predicting climate change and analyzing a crime pattern. Additionally, geographic information system is driven by the smart cities coupled with increasing location based services. However, lack of awareness regarding geographic information system for land managing solution is the factor restraining the growth of the market. The rising application of geographic information system in the field of construction is anticipated to boost the market demand over the forecast period. Similarly, the demands for location-based services, such as real-time status and control of a valve, have been on a rising opportunity around the globe. The report on global geographic information system market covers segments such as devices, components, usage and application. The devices segments include mobile and desktop. On the basis of components the global geographic information system market is categorized into hardware, software and services. Furthermore, on the basis of usage the geographic information system market is segmented as mapping, navigation and surveying. On the basis of application the geographic information system market is segmented as construction, mining and geology, aerospace and defense, transport and logistics, oil & gas, agriculture, utilities and government. The report provides profiles of the companies in the global geographic information system market such as, Bentley Systems, Inc, Hexagon AB, SuperMap Software Co., Ltd, Autodesk Inc., The Economic and Social Research Institute, Trimble, Inc, AutoNavi Software Co., Ltd, Topcon Positioning Systems, CARTO, and Pitney Bowes Inc. The report provides deep insights on demand forecasts, market trends and micro and macro indicators. In addition, this report provides insights on the factors that are driving and restraining the global geographic information system market. Moreover, IGR-Growth Matrix analysis given in the report brings an insight on the investment areas that existing or new market players can consider. The report provides insights into the market using analytical tools such as Porter’s five forces analysis and DRO analysis of geographic information system market. Moreover, the study highlights current market trends and provides forecast from 2018 to 2024. We also have highlighted future trends in the geographic information system market that will impact the demand during the forecast period. Moreover, the competitive analysis given in each regional market brings an insight on the market share of the leading players. Additionally, the analysis highlights rise and fall in the market shares of the key players in the market. This report will help manufacturers, suppliers and distributors of the geographic information system market to understand the present and future trends in this market and formulate their strategies accordingly.